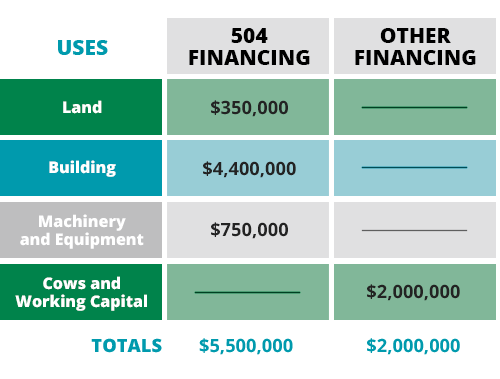 The SBA 504 Loan provides long-term, fixed rate financing to new or expanding businesses for use in acquiring land, constructing a new building or renovating an existing one, and purchasing equipment, fixtures, or machinery. Often agribusiness operations have difficulty qualifying for traditional financing because of large down payment requirements. Projects financed through the 504 may qualify for 80 to 90 percent financing (including the private lender’s loan) of their cost, thus conserving valuable operating capital. The end use determines whether a project qualifies for 504 financing. It cannot be used to finance production expenses—seed,fertilizer, livestock, feed—or “moving equipment”, including tractors, motorized implements and airplanes. While the 504 program can be used to acquire real estate for specific value-added uses, it cannot finance the purchase of cropland or pasture. Agribusiness projects will be reviewed for eligibility on a case-by-case basis. Potential applicants are urged to discuss their needs with First District Development Company early in their planning process. Facility acquisition, construction, renovation or expansion, including the purchase of land specifically related to the agribusiness venture. This may include land and site improvements. Interest on interim financing. Refinancing is not allowed. Professional fees directly attributable and essential to the project—surveying, engineering, architectural or legal. It must be a for-profit entity (corporation, LLC, LLP, partnership, proprietorship, or a producer cooperative) and must have a sound business purpose. The net worth of the business and its affiliates must not exceed $15 million. Its average net income (after taxes) must not exceed $5 million for the last two years. The applicant does not need to be identical to the operating company. However, the operating company must occupy at least 60 percent of new construction, and occupy an additional 20 percent within ten years. The remaining space may be leased out long term. 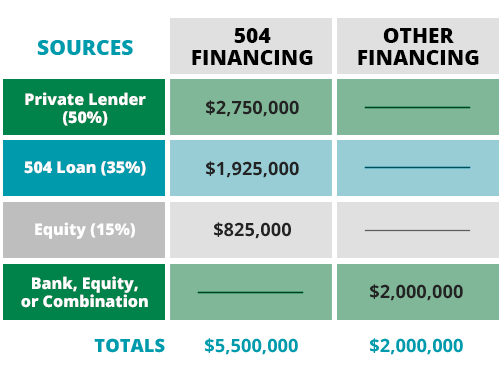 A complete 504 financing package is a combination of at least three sources: First District Development Company (SBA 504), borrower equity and a local financial institution. Through First District Development Company, the SBA may loan up to 40 percent of the total project cost, for a minimum of $50,000 and a maximum of $5,000,000. The agribusiness receiving the financial assistance must inject at least 10 percent of the total funds for any project (and in some cases up to 20%). This can be in the form of cash or land already owned. 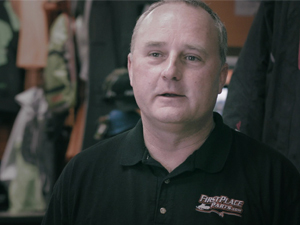 The balance—usually 50 percent—is provided by the local financial institution. Terms – the 504 program offers terms of 10 years for machinery and equipment loans, and 20 or 25 years for real estate loans. Collateral and Security – the borrower must provide collateral to secure the loan. 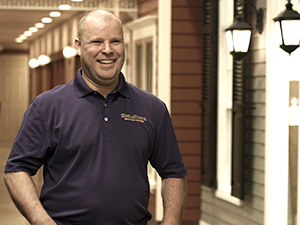 This will include a mortgage on the land and building being financed; liens on machinery, equipment and fixtures; lease assignments; and personal guarantees from individuals with 20 percent or more ownership in the company (or limited guarantees from those with less than 20 percent ownership). The local financial institution has the security of the first lien on the collateral, with First District Development Company holding the second lien. Interest – interest rates for the 504 are generally below market rates. The interest rate is determined at the time the 504 loan is closed after project completion, and is fixed throughout the term of the loan. Interim Financing – funding of the 504 portion of the loan package usually takes place about six weeks to two months after the project is completed. This means that interim financing is required, usually by the local financial institution that holds the first mortgage; the lender advances capital as the project begins and is repaid from the proceeds of the SBA debentures. Fees – a one time processing fee, which can be financed with the 504 loan proceeds and an ongoing servicing fee that is included in the effective loan interest rate. Repayment and Prepayment – loan repayment begins on the first day of the month following the sale of debentures. A prepayment penalty applies during the first half of the loan term, starting at 100 percent of the debenture interest rate and declining to zero at the midlife of the loan. Contact First District Development Company to find out more about project eligibility and establish preliminary feasibility.